On Sunday, August 24th from 11:00am-4:00pm, the Maryland chapter of Young People in Recovery (YPR) will hold a free event in order to create a more “recovery ready Maryland.” Maryland Addiction Recovery Center is proud to co-sponsor this event. The purpose is to raise awareness of addiction and recovery, break the stigma of addiction on a local scale and attempt to make resources for housing, education and employment more available for those people entering recovery. 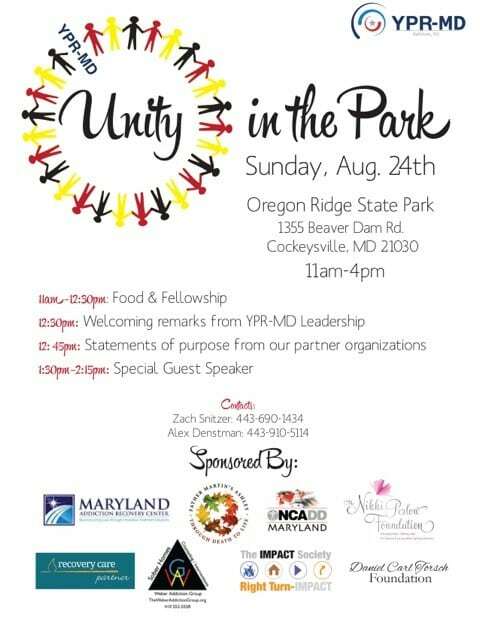 The Unity in the Park event will take place at Oregon Ridge Park in Cockeysville, Maryland. The barbeque event will be free for all who attend and all are welcome. The hope is that this event will draw people in recovery, seeking recovery, family members, friends, professionals in the treatment and recovery fields and community, religious and political leaders in order to break down barriers of addiction and recovery and create a more sustainable recovery-friendly Maryland. Besides Maryland Addiction Recovery Center, other event sponsors include NCADD-Maryland, Caron Treatment Centers, Father Martin’s Ashley, The Impact Society, Recovery Care Partner/Bethesda House, Weber Sober Homes, The Nikki Perlow Foundation and the Daniel Carl Torsch Foundation along with educational sponsor Alkermes, maker of Vivitrol. Some major issues that YPR-Maryland has identified as areas of need is the lack of recovery residences and sober homes in Baltimore County and throughout the state of Maryland and a lack of college recovery resources throughout the state. Unity in the Park is hopefully the first step in setting up a state wide dialogue in filling the gaps of resources that plague those entering addiction recovery. Future meetings of YPR-Maryland and the organizations sponsoring the event have been set up in order to continue an ongoing discussion to make Maryland more recovery ready to deal with the overall addiction issues and overdose epidemic that has been prevalent throughout the city of Baltimore and state of Maryland for many years.